Bespoke: Made by Hand & Earth. Only the finest materials, and nothing but... gemstones! In a hurry? Prêt-à-porter for mermaids! Do you have your own design in mind? Can't get it onto paper? Overwhelmed with the options? Let us help. We know what can be done, and what not, and how much it will cost. Let's create your own jewelry with unique gems: the royal option. Wonder about the cost? Not as royal as one might think, thanks to the internet. Let us make an offer. We supply diamonds in any quality and quantity on cost-basis. Better yet, we have fine melee of rare Sandawana emeralds, sparkly tsavorites or any other colored gemstones you may desire. A good selection of pairs for sidestones are ready in stock. Others can be hunted. Since every design is different, we make individual quotes for every project. Heavy and simple designs can be cheaper per gram, but light and complicated designs might be more expensive. 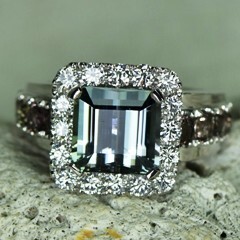 However, the minimum budget for an individual design will start somewhere around $400 plus the cost of the stone. In any case: Our quote is binding. We will not exceed your given budget. It makes little sense to wreck your brain about design-details BEFORE you have decided on a specific gem. Gold and platinum can be hammered, white diamonds are commodities, but a specific gemstone cannot be forced from nature. Only synthetic gems can be made to fit a design. In our market section, the gem is the starting point of all jewelry. Therefore, we suggest to buy or at least reserve a gem BEFORE we start working on a design. Although tempting, we also advice you not to publish your dream-gem on social-media unless you have secured ownership. We have seen too many gems snatched away while we were working on design details. Therefore, reserve (25%) or purchase first. We may even ship the gem to you for inspection and only then start the jewelry process. Shipping has become easy and safe, plus we have logistic points inside the USA and the EU. Once the gem is secured, we will help you to choose the right design for your gemstone. You may provide us with only an inspiration like 'sun' or 'leaves', or have more concrete ideas from past-projects or google-images, or you may have a very detailed idea already. In any case, we will tell you what works and what doesn't, honestly. Is the gem protected, secure even after ten years? Will its brilliancy suffer? Will it look as you imagine? Will it be comfortable? Is it within budget? Which is the best material, or material combination? What kind of sidestones, if any? Is it physically balanced? Will it LOOK balanced? Comfortable to wear, even after years? Can it be cleaned? Is it too heavy, or not heavy enough? There are a thousand devils in the details, and we know them all, as far as humanly possible. Finally, we will have a project-plan with an estimate based on images, sketches, prose or whatever helps our goldsmith and his team to transfer your vision into a realistic piece of valuable and durable jewelry. If something doesn't work out as planed (that happens), we go back and re-design, until it is perfect. Oro Verde ("Green Gold") is, like us, committed to bring the benefits of globalization to the mining areas while fighting ecological and social mismanagement. With only 10% premium on international gold prices, Oro Verde does a great job in developing the local communities and protecting their environment. We feel that is money well spend! (Their supply is limited but we do our best, as always). Most designs can be produced in less than six weeks plus shipping time, starting AFTER the design process is concluded (see above). If you don't like the results, we will re-make or re-pair until you are satisfied, free of charge. If we have done faulty work you get a full refund, or we will re-make / re-pair, free of charge. As always, we can only refund if the item is returned undamaged and with its original paperwork (if asked for). It is normal and righteous to relate and discuss existing designs or stiles in order to create your own individual jewelry, but we will not steal other people's creative work or infringe any copyrighted designs. Most mass-produced jewelry is done in 14k, or still worse in 8k. It wears down; and turns dull and lusterless. 22k is beautiful but soft for hard working jewelry. Only for soft life-styles or special occasions. 18k is the sweet point. It keeps the shine for years and is strong enough to protect the gem. White gold can be plated to be pure white but this must be re-done every few years. Maintenance-free un-plated white gold has gained popularity with its charming yellow gleam. Try it out. Today, you may also choose from a variety of hues: Pink gold, rose, even purple or green are on offer. Prices will be slightly higher for exotic mixes (like 10-20%). Platinum is the prime choice for high-end gemstoneis heavier and more expensive than gold; and it is also more demanding to work with. Not all goldsmiths can do it. It never looses luster and does not wear down. Estimate to at least double the cost from 18k gold to platinum. Silver is not much used for individual settings anymore. It is not sufficiently strong and durable for precious gems. Even if you wanted to use silver it is not easy to find good silversmiths. Update 2019: We have found a UK silversmith doing fantastic work, extravagant and special. Ask us for ideas. There are other materials like steel, wood or cotton that experienced jewelry artists work with, but they are not a first choice for precious gemstones. We can do, and have done, such projects if you are ready for the adventure. Prongs lead the pack. They are delicate, offer many design varieties and show the most of any gem, its luster, color and size. However, they get do caught in stuff, bend open and loose gems; oh horror. If you do go for prongs, make sure they don't stand out. The finger tip should run smoothly over each prong's end and back. Try to hook up your favorite shirt before you go out. Better then than later. Bezels are the safest type of setting but they are also more expensive, need more material and extra work. For battered jewelry (rings and bracelets) in active lifestyles we recommend bezel settings. People are unnecessarily worried here. Within the limits of human predictability no goldsmith will risk jail-time to pinch some gemstones. As much as car-repair-shops won't steal cars. It just isn't a profitable business model. The thorough mind may use inclusions to identify any gem. Inclusions are like fingerprints and can not be copied. Every natural gem has inclusions visible latest under a 30x magnification. In most cases you will only need a handheld 10x loupe ($25) to check the authenticity of your gem before and after setting. Take a good, deep look. Lacking photographic memory you can make a sketch of the gem's inner landscape: Five needles sitting in the upper left corner, a fracture in the second upper facet and an oval-shaped cloud in the lower center - you can be sure to indentify your gem anytime. Hand-made chains are very expensive and generally too gangsterish for a conservative scenery. Chains from a real goldsmith can be $10k and then some. If you want something special you can order high-end chains made in Swiss or Germany. They are exquisite and come in various designs and materials. A fine gemstone pendant deserves a fine chain. Calculate at least $1k for a high-end gold chain and 3k for platinum. Regardless of your budget, it is recommended to source the chain after the pendant is done. With pendant in hand it is much easier so find a perfectly matching chain. Chinese machine-made chains should not cost much more than the material plus some margin for the trade. Think of very few hundred dollars for good-enough quality, but don't penny-pinch or your pendant will be gone one day. This happens but you can not ask the goldsmith to cover the risk. Ask the seller to take the risk for his stone. Again, if you can't trust your goldsmith forget about it. See also further down the page. A dedicated goldsmith can create a standard setting in a day's work if all is well prepared. More time is needed for logistics and creative work. A realistic turn-over for an individual but familiar design at the local bench is a week or two. If it is your first time and you plan a Christmas present or an important yes-or-no-question start a few months ahead. A good goldsmith will always have a line of work waiting. You will need to queue up. If not, he might not be the best craftsman. As a rule, the smaller the gem the more luster it will need to be visible; the bigger a gem, the more will its color be important. After a few project you get a good personal feeling for carats and dimensions. 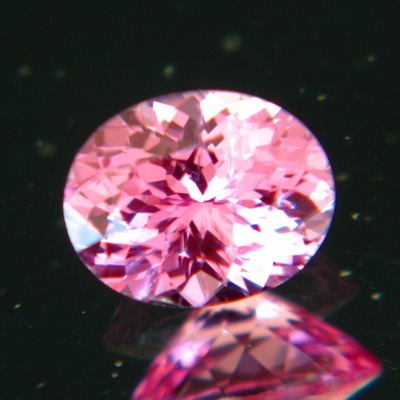 0.2 carat is tiny - hardly big enough as stand-alone gem in jewelry. 0.4 carat is still tiny for most occasions but in a terrific quality and in an equally delicate design it may just become visible. 0.8 can be considered as a solitary ring gem but, again, you need good quality; and some diamonds will help. 1-3 carat is the standard go-to size for a ladies ring and the smallest size for a pendant. 3-6 carats can be opulent in a ladies ring, perfectly sized in a gents ring and make a still modest pendant. 6-10 carat makes a big stone, needing full ring sizes, heavy designs, and the willingness to bear the weight (and the cost). Ten carats are probably not every-days choice in a ladies ring but can be worn on special occasions. In pendants ten carats will be very visible but not yet bulky. Over 10 carats we enter the world of posh pendant-only jewelry. Citrine or Topaz is sometimes seen in 20+ carat sizes but heavy-weight precious gems are rare in jewelry (without bodyguards). For cabochons double the scale. Less than one carat in a cabochon is small. 10 carat cabochons are still good measure. Disclaimer: Honestly, there are a million things to learn. But don't be discouraged. It is much more rewarding to create good quality hands-on than buying bad quality hands-off. If you do not want to make any mistakes on your first project, set two carats in an 18k gold bezel and little can go wrong. Any Qs, let us know. Advice on taking our gems to a local goldsmith. While we do mount roughly a third of our gems, another third is taken to local goldsmiths (the rest is bought for collection only). This is a good way to combine the choices of the web with the touch and feel of a goldsmith's workbench, but it often ends in discord. 1. Margin: Let them live. A goldsmith used to earn from his craft and he had a margin from selling stones and metals. Today, the margin is threatened. Gold prices are public knowledge and gems sell on Ebay. Setting somebody's gemstone is a completely different business than selling a finished product. A goldsmith who has not yet found a way around this problem will react negative to somebody walking in with his own stone. He needs to re-calculate his margin for a walk-in gemstone. Be prepared to pay more for such a job than you would on a ready-made piece from the same guy. Also, a local goldsmith will charge significantly more than a dot.com using a Chinese goldsmith factory. If you want the extra service you have to pay for it. 2. Guarantees: Cover the risk. When a goldsmith sets his own gemstones he takes the risk and gets the profit. For a walk-in gemstone he is left with only the risk. Gems do sometimes break or suffer; stuff does go wrong. Any goldsmith working on somebody else's gem needs to be freed of liability for the gem. Especially if you want him to set an apatite or some other sensitive animal you can not expect any guarantees. Let's assume he does not destroy it on purpose, nor steals it; then the rest-risk is yours. Get a guarantee from your seller: If a gem breaks under normal working pressure it is the seller's responsibility. In any case you need to take the risk from the goldsmith. Most goldsmiths have good insurances for these cases. Make sure the rules are clear before you give a 'go'. Do not expect a local goldsmith to know everything about cc apatite or rutile pezzottaite. If you are reading here, you are likely to have as much knowledge of colored gemstones as the average goldsmith. Most goldsmiths work regular only with the big four, some topaz and maybe a cat's-eye. Be polite; help them along. You may print out some data on your stone, or simply let them research a small variety before you pester them about a setting. Be generous, fair and kind. For every sale that goes through our company we purchase rainforest to be conserved by the WLT. Each $ will buy one square meter of rainforest in Columbia and customers will get their own certificates issued to their name. How big is "two carat"? Read here to judge gemstone sizes for jewelry.